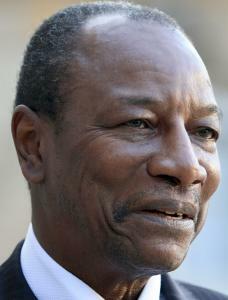 Gunmen attacked the home of Alpha Conde. CONAKRY, Guinea - Guinea’s president survived an assassination attempt yesterday after gunmen encircled his home overnight and pounded it with heavy artillery, throwing into doubt the stability of the country’s first democratically elected government in a part of the world that has long been ruled by the gun. President Alpha Conde was awoken by the shooting, which erupted around his residence between 3 a.m. and 5 a.m. yesterday. A rocket-propelled grenade landed inside the compound, destroying a part of the house, and one of his bodyguards was killed while several others were wounded, said Francois Louceny Fall, a minister at the presidency who acts as Conde’s chief of staff. The 73-year-old Conde later addressed the nation on state radio, saying his security detail had “heroically fought, starting at 3:10 a.m. until reinforcements arrived.’’ He urged the population to remain calm and said the attack would not derail the promises he made to voters seven months ago when he became the first democratically elected leader in Guinea’s 52-year history. Just hours later, shooting broke out again near the president’s home, and residents said they saw the red-beret-wearing presidential guard take fighting positions. Although it remains unclear who was behind the first coordinated attack, the second was led by a fighter dubbed “De Gaulle’’ who was a bodyguard of the country’s former military strongman and who was arrested at the scene, Fall said. Soldiers fanned out across this capital city, located on a peninsula jutting out into the Atlantic Ocean on Africa’s western coast. They tied ropes between trees at intersections, and traffic was at a standstill as each car was stopped and drivers were told to open their trunks. Military helicopters circled overhead.